This work, that expresses in material form a modern reinterpretation of the myth of Danaë, has taken over the entire space, even requiring structural work to be carried out on the pavilion — built in 1914 by Alexei Shchusev — in the form of a large square opening between the two floors. 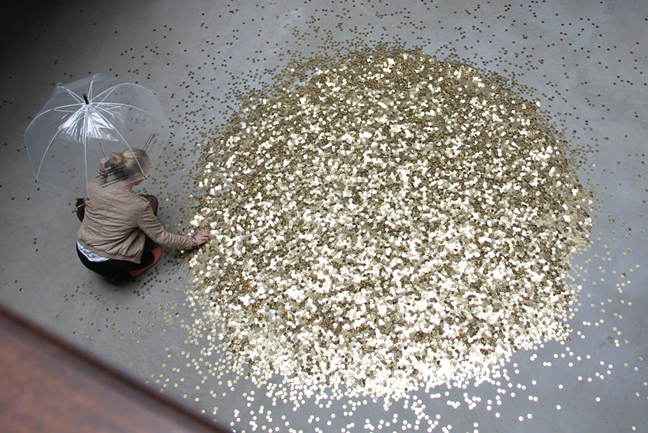 A bucket of coins forged by Zakharov — each is a Danaë — passes up through the opening in the ceiling. 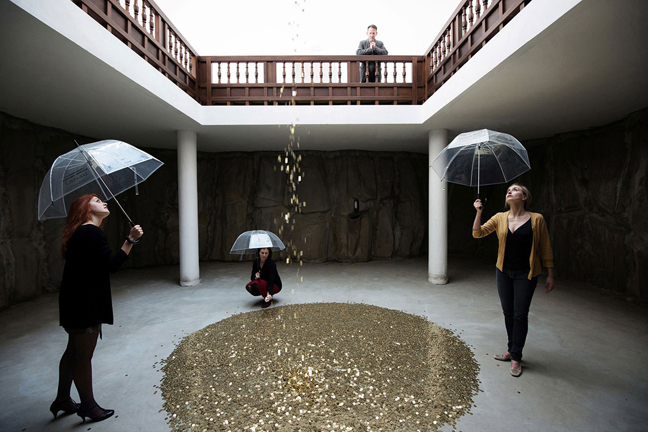 The coins shower down like fine rain in a circle from the upper to the lower level. Here they are collected by women protected by umbrellas who put them back into the bucket, which is hoisted by hand up to the first floor, from where the cycle starts all over again. The performance works on various levels — cultural, philosophical, sexual and psychological — engaging visitors in the presentation of a myth and its values. 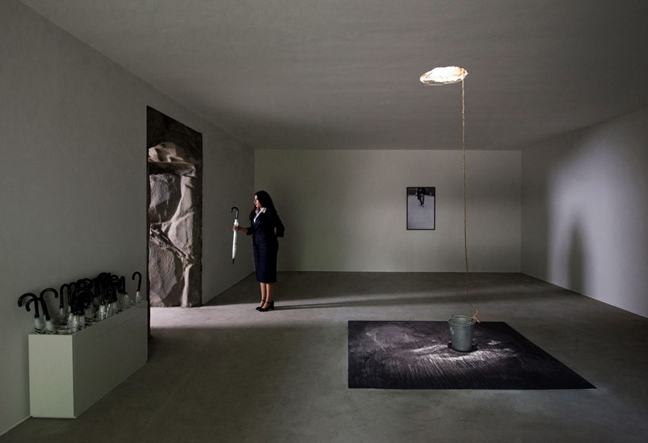 At the Giardini, the formal elements of the myth are all there but they are used as instruments to overturn the power games between men and women revealed by the Greek myth and above all to bring to the fore a number of values that Zakharov claims are neglected by today’s society, as well as condemning others. At the Russian pavilion women are not passive observers or instruments in the hands of men but a driving force for the whole building, the engine for the mechanism that circulates the coins: the small Danaë specially forged by the artist that are the guarantor for the values that they support — trust, cohesion, freedom, love. The women’s room on the ground floor — symbol of the maternal womb, a place that men are forbidden to enter — is the beginning of the cycle staged by the installation. 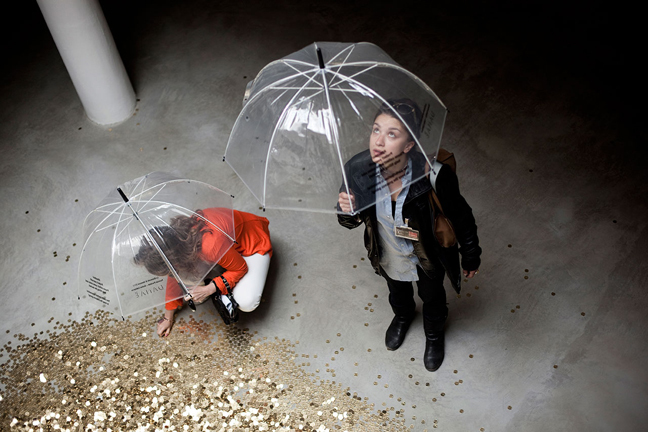 Those entering have the task of collecting the coins, as many as they want, keeping one for themselves and putting the rest in the bucket that sits at the entrance of the gynaeceum, so as to foster positive values to put back into the cycle that animates the building. The rooms for the men are on the upper floor and contain a harsh invitation to reflect on their guilt: it is the moment to confess, among other things, rudeness, lust, greed, narcissism, demagoguery, banality, envy, gluttony and stupidity. 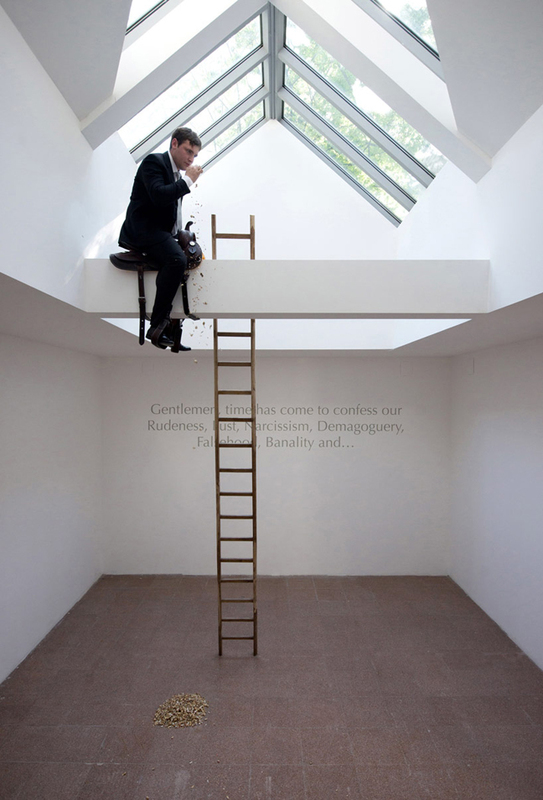 In the first room is a man in a suit and tie suspended on a beam, straddling it, who reflects on his own mistakes eating nuts. In the second room, around the large central opening through which the coins fall from the ceiling, is a circular red velvet stool for kneeling: the men are constrained in an act of humility. 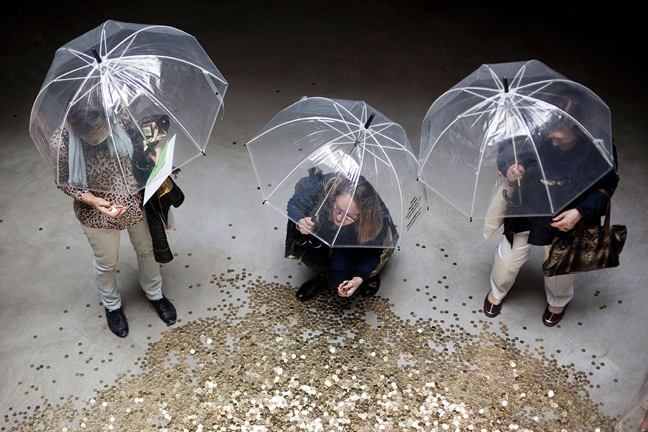 Zakharov’s Danaë also speaks of the relationship with money in a society that is completely commercialised. In the vision of the artist, the man straddled on the beam is a symbol for those working in the banking system, who live in another dimension with respect to ordinary people: sitting in a saddle without a horse represents the loss of a sense of reality, disinterest towards those who find themselves in an increasingly difficult economic situation.